China on Monday successfully launched its longest manned space mission, sending two astronauts into orbit to spend a month aboard a space laboratory, a milestone event in the Communist giant's ambitious plan to set up a permanent manned space station by 2022. 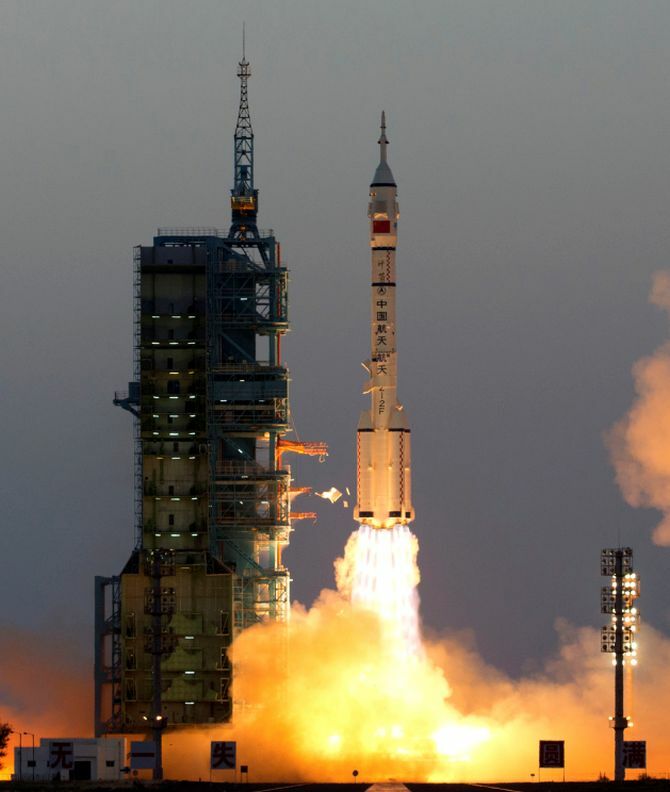 The two astronauts, Jing Haipeng, 50, and Chen Dong, 37, took off from the Jiuquan Satellite Launch Centre in northern China on Shenzhou-11 (heavenly vessel) spacecraft at 7:30 am local time (5 am IST). They will dock with the experimental Tiangong 2 space lab and spend 30 days there, the longest stay in space by Chinese astronauts, Wu Ping, Deputy Director of China's manned space engineering office said. This and previous launches are seen as pointers to possible crewed missions to the Moon or Mars. The Shenzhou-11 was put into orbit by a Long March-2F carrier rocket after the launch, telecast live by state-run China Central Television. While Jing is on his third spaceflight, this is Chen's first. During their stay in space, the astronauts will conduct tests on spacecraft-related technologies and scientific and engineering experiments. 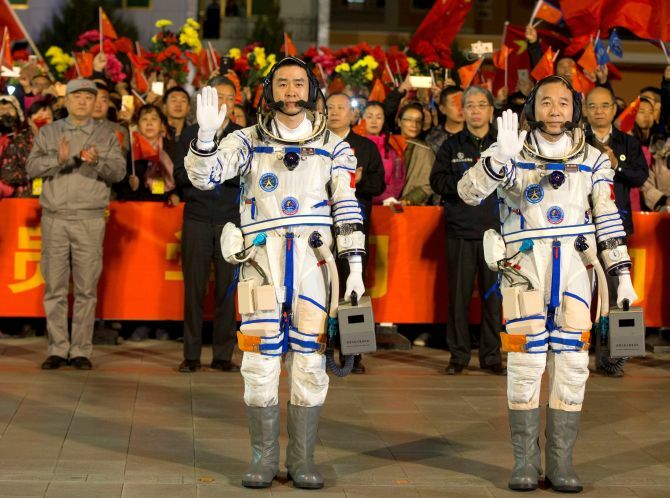 The mission was declared a success by Zhang Youxia, commander-in-chief of China's manned space programme, about 19 minutes after the blast-off. President Xi Jinping, who is currently in Goa to attend the BRICS Summit, congratulated everyone engaged in the mission for the successful launch, saying it is a milestone in China's space programme. The mission of the orbiting space lab Tiangong-2 and the Shenzhou-11 manned spacecraft marks the first time that Chinese astronauts will stay in orbit for medium term, Xi, chairman of the Central Military Commission and general secretary of the Communist Party of China Central Committee, said. In his message, he encouraged staff of the mission to "constantly break new ground for the manned space programme, so that Chinese people will take bigger steps and march further in space probe, to make new contribution to the building of China into a space power". Premier Li Keqiang and Liu Yunshan, both members of the Standing Committee of the Politburo of the CPC Central Committee, watched the live broadcast of the launch at the command centre of China's manned space programme in Beijing. The space lab was launched last month as part of China's efforts to set up its own manned space station by 2022, which will make it the only country to have such a facility in service as the current in-service International Space Station retires by 2024. China is putting billions of dollars into its space programme in a bid to catch up with the US and Europe. It also plans to launch its maiden Mars mission in 2020 to match India and others. Hours before the lift-off, the two astronauts appeared in good spirits and answered several questions. "Although the job is challenging, risky and dangerous, there is nothing more I would rather do," Jing, commander of this mission, said. Chen, on his maiden space mission, said: "I will treasure every moment in space and ensure I record my experience in my diary and enjoy the out-of-this-world scenery." China, which conducted its first manned space mission in 2003, has said its space programme is for peaceful purposes, but it has also tested anti-satellite missiles in addition to its civilian aims. Several technical alterations have been made to Shenzhou-11, though its main functions and technical parameters are basically the same as Shenzhou-10, Wu said. Lei Fanpei, chairman of China Aerospace Science and Technology Corp, recently said China plans to launch the experimental core module of its space station around 2018 with a Long March-5 heavy load carrier rocket, and the 20 ton combination space station will be sent into orbit around 2022. The space station has a designed life of 10 years in orbit 400 kms above the earth surface. With this space station, China will become the second country after Russia tohave developed a space station.